In 2012, a UK court convicted Ibori of money laundering, with most of his property in the country risking confiscation. He, however, appealed the conviction. 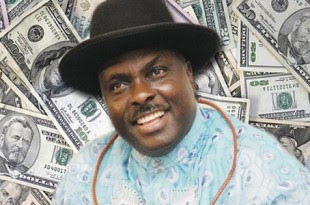 In the latest edition of its monthly media publication, EFCC ALERT, the anti-graft agency said Ibori is on a “campaign of calumny” targeted at UK police officers in retaliation of his conviction. The report, written by Segun Adeoye, an assistant editor of the publication, also accused him of employing media propaganda to paint himself as “a victim of persecution”. “One of such, published on financialwatchngr.com, November 28, 2016, claimed that the UK had opened ‘fresh investigation of corrupt policemen involved’ in Ibori’s trial. The report credited to a statement by Tony Eluemunor, Ibori’s media aide, had posited that ‘the latest investigation’ was by the Independent Police Complaints Commission (IPCC),” Adeoye wrote. “Investigations, however, indicate that there was in fact, no such ‘fresh investigation’ and the IPCC was not investigating anything new. Interaction with one of the officers involved in the investigation and prosecution of Ibori, indicates that no such notices, as claimed in the Eluemunor statement, was served on the officers. Adeoye said allegations of bribery and corruption on part of police officers who investigated Ibori, were dismissed in July, 2014 by an appeal court. “The court ruled that the allegation that Risc Management Limited (RML), a company of private investigators gave bribes to officers in the course of investigation, in exchange of ‘privileged information’, was ‘a very grave one’, but “such allegation has in fact already in substance being investigated and rejected,” Adeoye wrote. The report accused the Ibori media team of “fighting dirty” to the end, citing when in May, the team claimed “legal victory” for Ibori, and portraying him as a “victim of persecution”. Adeoye said a report by the Ibori media team said Ibori secured ‘victory’ against the UK government, and that ‘Ibori’s human rights had been violated’ by Amber Rudd, the UK Home Secretary. “No doubt, the ‘other side of the news,” he wrote. “In actual fact, Rudd had tried to keep Ibori in the UK so that his confiscation hearing could be dealt with. A trial judge had rejected Ibori’s claim for £4,000 in damages, and instead awarded “nominal damages” of £1 for his being kept in custody for an extra 42 hours. “The decision to keep Ibori in immigration detention, the judge opined, was probably because of millions of pounds authorities were yet to recover from him, as against a violation of Ibori’s rights as alluded to by the report.